I really liked Super Mario Kart. Still do, actually. It’s one of those games that’s easy enough to pick up that anyone can play it, and complex enough that you can spend hours upon hours learning its intricacies. So what is it? It’s a series of kart races, starring characters from the Mario universe. Why are they racing? Doesn’t matter. What does matter is that you have to take your go-kart of choice and try to win races set in courses themed after locations in the other Mario universe games. To make it a little more exciting, you can get coins to slightly boost your speed, but the real fun comes with the items you come across. You have shells to throw at your enemies, mushrooms to give you a boost of speed, feathers to jump real high, etc. It makes the game just a little unpredictable, which adds excitement. There’s also a ‘battle mode’ where you and a friend scoot around a track, hunting each other down and trying to pop balloons on your opponent’s kart by hitting them with the items. 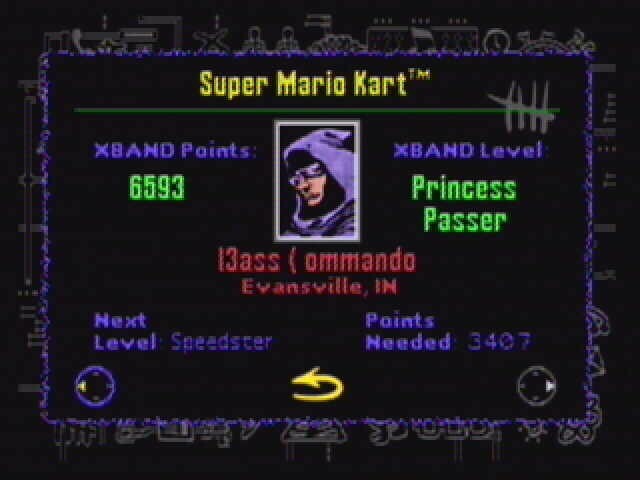 I played this game a lot when I bought it, but I really got my enjoyment out of it from the XBand modem. After playing with my circle of friends for weeks upon weeks, I thought I was pretty good at this game (and I was, really). But there were some folks on that network that were leaps and bounds better than me. Though I still won my fair share of matches. I still like to pick it up occasionally, though finding opponents is getting tougher and tougher these days. They want to play the new games in the series, which I can’t really fault them for. This entry was posted on Sunday, December 9th, 2007 at 12:34 pm	and is filed under Super NES. You can follow any responses to this entry through the RSS 2.0 feed. You can leave a response, or trackback from your own site.